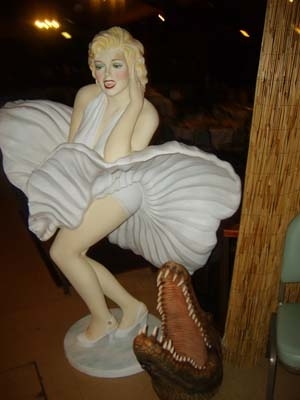 This fabulous statue is inspired by iconic pictures of the film-star Marilyn Monroe in a white dress. The model captures the famous Hollywood actress in one of her most glamorous poses. With her billowing shirt and flirtatious stance this Marylin Monroe figure captures the Hollywood icon at her most glamorous in the 1955 film The Seven Year Itch. 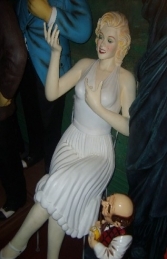 This life-size cold-cast poly-resin and fibre-glass 3d figure of the actress is ideal for music, entertainment and Hollywood themes, Movie and film displays, advertising or drawing attention to your business or for the home and garden. 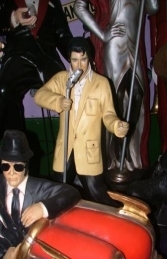 Our Hollywood and Entertainment Series statues can be used in shops, businesses, pubs, restaurants, coffee shops, adventure golf courses, theme parks the list is endless! These figures make a huge impact at a themed party and will always have lots of people wanting their pictures taken with the stars.